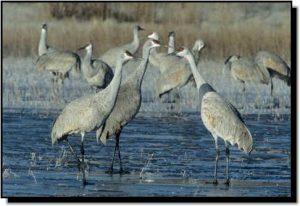 Comments: Sandhill Cranes nest in isolated marshy wetlands, flooded meadows and river valleys. Although two eggs are typically laid and hatched, usually only one chick, called a colt, fledges. During migration and winter, Sandhill Cranes form large flocks and are found in wide, shallow river channels, large open marshes, agricultural fields, pastures and playa lakes. Under certain lighting conditions, gray Sandhill Cranes appear silvery and may be mistaken for Whooping Cranes. Occasionally, Sandhill Cranes appear brown or rusty which is a result of feeding in muddy conditions. Although similar in size to a Great Blue Heron, cranes fly with necks stretched out straight. Powerful wing strokes consist of a snapping upstroke followed by a slower downstroke. When standing, herons lack the feathery pompadour rump of a crane.